The world has signed a pact . . . It is a covenant to which every thing, even every hydrogen atom, is bound. The material properties of ice discussed in chapter 2 govern its macroscale behavior in the global cryo-sphere. Much of the cryosphere's influence in the climate system stems from its role in local, regional, and global energy balance. Snow and ice reflect solar radiation back to the atmosphere, reducing heat absorbed at Earth's surface. The latent heat associated with phase changes provides a thermal inertia that is similar to the moderation of maritime climates from the heat capacity of the ocean. In the autumn and winter, freezing of water in rivers, lakes, and the oceans releases energy and provides a source of sensible heat. Melting of snow and ice in the spring and summer has the opposite influence, providing an effective "heat sink" for the radiative and sensible heat that would otherwise warm a region. These processes all involve exchanges of energy between the atmosphere and the snow or ice at Earth's surface, as well as the internal thermal evolution of a snow or ice mass. The underlying physics are relevant to all of the elements of the cryo-sphere, so we consider the main aspects of snow and ice thermodynamics in this chapter. 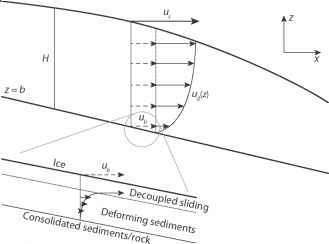 Features of snow and ice thermodynamics that are specific to a particular element of the cryosphere are deferred to subsequent chapters.